Granite is a versatile, natural material builders have favored for millennia, for everything from flooring to countertops. Portland homeowners who are looking to add a “wow factor” to their kitchen designs will do well to incorporate granite. This naturally occurring material is bold and beautiful in both kitchens and bathrooms. Read on to discover how to best match granite colors and to learn about our current granite and quartz countertop offer! While quartz is ground down and re-poured to create countertops or backsplashes, granite is typically installed in full slabs. This means color patterns in granite countertops are naturally occurring. Similarly, while the grains of color in quartz are approximately the same size (having been ground down during the manufacturing process), the “splotches” in granite aren’t necessarily uniform. 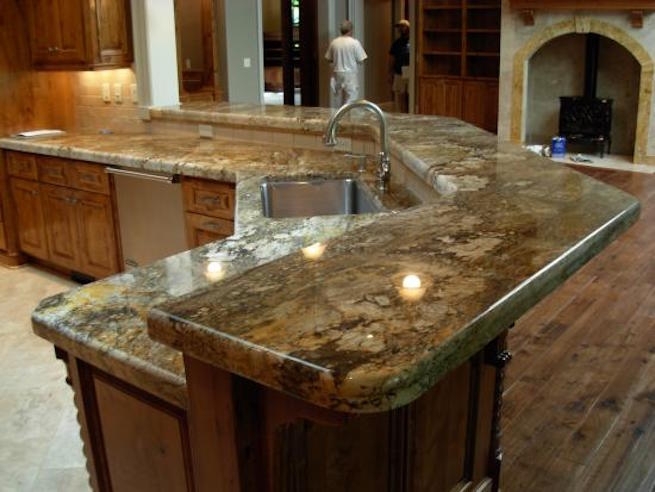 The design corollary is that granite allows you to make a loud and stunning splash with your countertops. Portland residents looking to make a bold statement will love the look of granite countertops and backsplashes. Black granite with wood accents. This is an especially popular pairing for in-home bars and professional spaces. If you wish to convey luxury and power, black granite can’t be beat. Grey granite with chrome accents. Those with more modern sensibilities will love this combination, which is subtle and elegant. Red/brown granite with brick. This coupling works well in a Tuscan design setting. To find a good color combination for your design space, bring material samples with you when shopping for granite slabs. For instance, if your kitchen already features mango stucco walls, it will behoove you to bring a sample of the mango paint when choosing granite for your countertops. Portland homes with subtler color choices can usually get away with installing more colorful granites. Naturally occurring materials such as granite appear best when lit well. Each slab of granite has its own shadows and patterns, most of which only become clear with good light. Aim to include plenty of natural light for your granite countertops. Portland homeowners with dark kitchens may want to consider installing tubular skylights. Alternatively, track lighting can help showcase your granite countertops after the sun has gone down.